Mobile photo sharing apps are hardly a scarce resource, and every contender has to face comparison with generally perceived leader in the field, Instagram. EyeEm, which launched during the summer on iPhone and Android, has done better then most at defining some reasons why you might choose it over its rivals. Today it has rolled out an update that makes those reasons even clearer. At its core, EyeEm does the same as any other app of its ilk – you take a photo, apply filters (these can be previewed before you snap the shot in this case) and share it to your friends. In version one of the app, EyeEm had an interesting idea of tagging not just your location, but also what you were doing to each picture. This would be intelligently guessed at. At a cafe in the morning? Perhaps EyeEm would guess you were having breakfast and automatically prepare tags it thought would be right. You could of course change the tags if you liked. 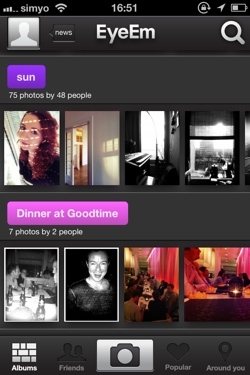 Beyond this, EyeEm would group photos from the same event, topic or place together – kind of like Color’s notorious first app, but not quite as aggressive in its implementation. 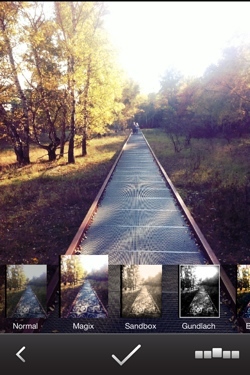 Every location and activity tag has its own feed of photos, creating some intriguing possibilities for the future. Despite this, and oozing Berlin style in its graphic design, EyeEm didn’t necessarily offer enough to to sway people from other, similar, apps. With version 2.0, the startup is looking to change that by bringing its smartest features to the fore. 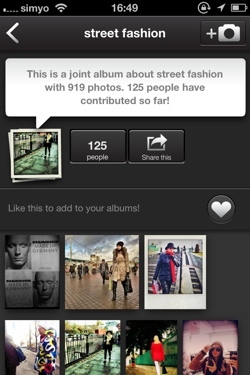 The new app introduces an album feed that automatically shows photos of current nearby events, places and trending topics immediately upon opening.Tweaks to both the mobile apps and the website have helped the app become more user-friendly , and ‘the EyeEm difference’ should be a lot clearer to new users now. Next up for the team is an API, which will allow third party developers to harness the location, activity, subject and user data being collected in EyeEm’s photos. This should be of interest to startups like Teleportd and Skylines, which are developing real-time social photo search solutions. The API is expected to launch within the next few weeks. 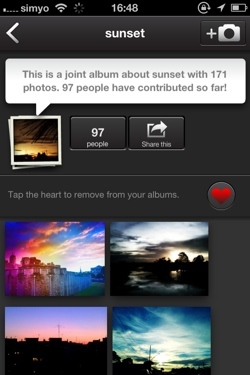 EyeEm’s unique take of social photo sharing is well worth a try. The new version is available now, as a free download for iOS and Android.